Ardour runs in conjunction with the JACK Audio Connection Kit ( http://jackosx.com/ ). JACK is an audio system which manages connections between Ardour and the soundcard of your computer, and between Ardour and other JACK-enabled audio programs on your computer. You must install Jack OS X before you can use Ardour. After downloading Jack OS X, you will be automatically prompted to open the installer with a window similar to the one below. If you don't see any window, just find the file you just downloaded and double-click on it. 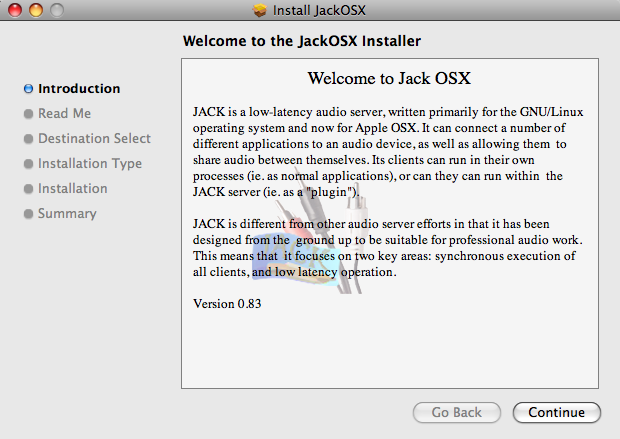 The Jack OS X installer should open automatically. Just follow the instructions from the installer. Once you are finished with the installation, you should see a newly created Jack folder in your Applications folder. JackPilot is the user interface that allows you to control the Jack server and manage the audio connections between applications and/or Plugins. Double-click on JackPilot to start exploring Jack.